Instant Pot Candied Yams are sweet, and seasoned with just the right amount of Holiday spices. And of course, they are topped with perfectly browned mini marshmallows (from the broiler, which is fast!). 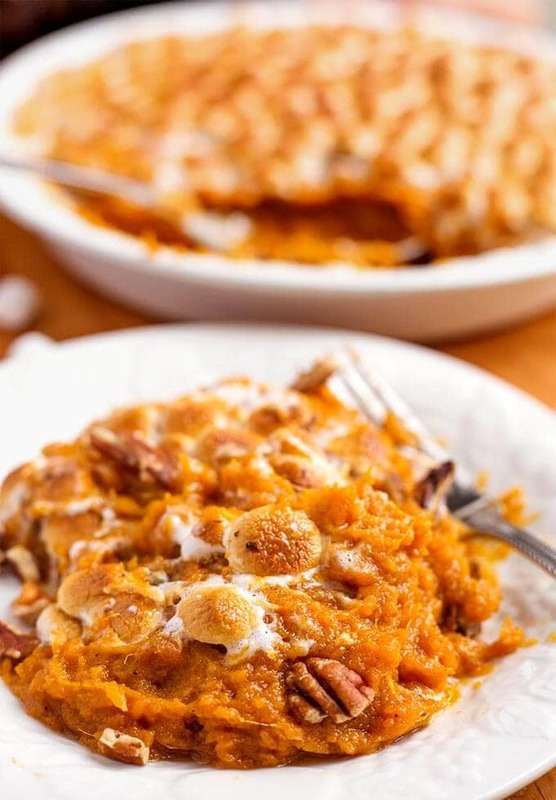 This year, make pressure cooker candied yams, and save some oven time! I have always looked forward to the candied yams at Thanksgiving. I love how sweet they are, and the toasty marshmallows on top just take them right to the moon for me! Fresh yams are so much better tasting than the canned stuff. Often we reach for the can because it’s convenient. The yams are already cooked. We are busy enough during the Holidays, and those of us with only one oven can attest to the fact that getting that Holiday meal on the table in a perfectly timed and orchestrated culinary dance is a feat among feats! This is where the Instant Pot really saves the Holiday! 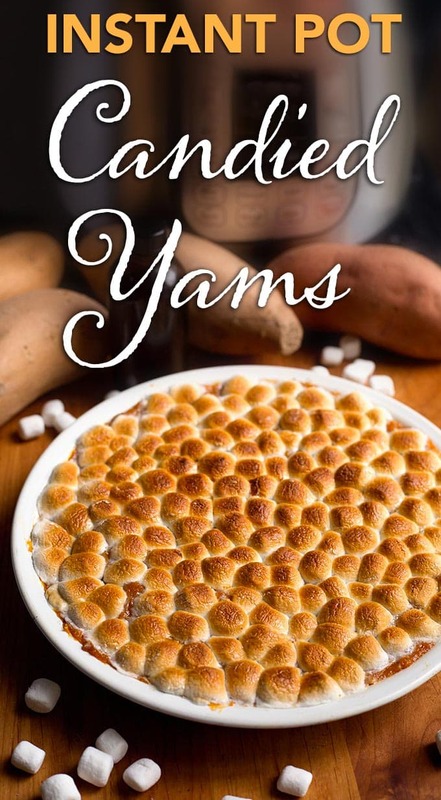 Cook your yams in your IP, and you will have fresh, delicious tasting yams that you made without having to use your oven (Well, except to brown the marshmallows, but that just takes a few minutes). You can make these ahead of time, and take them with you to grandma’s house, or wherever you are spending your Holiday, and just warm them up when you get there! So easy! 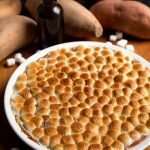 Instant Pot Candied Yams are the perfect Holiday side dish to make in your Instant Pot electric Pressure Cooker. With brown sugar, and some seasonal spices, these just need a quick broil to brown the marshmallows! Add the water and a rack/trivet to the inner liner of the Instant Pot. Scrub the Yams and use a fork to pierce a few holes in them. Then set them in the pot on the rack/trivet. Close the lid, lock it in place, and set the Steam Release Knob to the Sealing position (except Ultra models, just close and lock the lid in place). Press the Pressure Cook (or Manual) button or dial, and use the +/- button (or dial) to select 20 minutes (If your yams are small, reduce time to 15 minutes). While the yams are cooking, in a mixing bowl cream together 4 Tbsp of the softened butter, brown sugar, vanilla, cloves, cinnamon, and nutmeg. Set aside. Get a pie plate or similar sized baking dish. Set aside. When cook cycle ends, let the pot sit and do a Natural Pressure Release for 10 minutes. Turn off the pot. Then manually release the remaining steam by turning the Steam Release Knob to the Venting position (or push the button on the Ultra). When the pin in the lid drops, open it and carefully remove the yams to the pie plate or baking dish. Heat Broiler to 350 degrees (F) with the rack in the middle position. Use a fork to scrape away the skins. Then use fork to mash the yams. Add the butter mixture and combine well with the yams. Dot with bits of the remaining Tbsp of butter. Then spread the mini marshmallows over the top in an even layer. Put under the broiler (middle rack) for 5-10 minutes, or until marshmallows brown to your liking. Keep an eye on it as the browning can become overdone quickly! 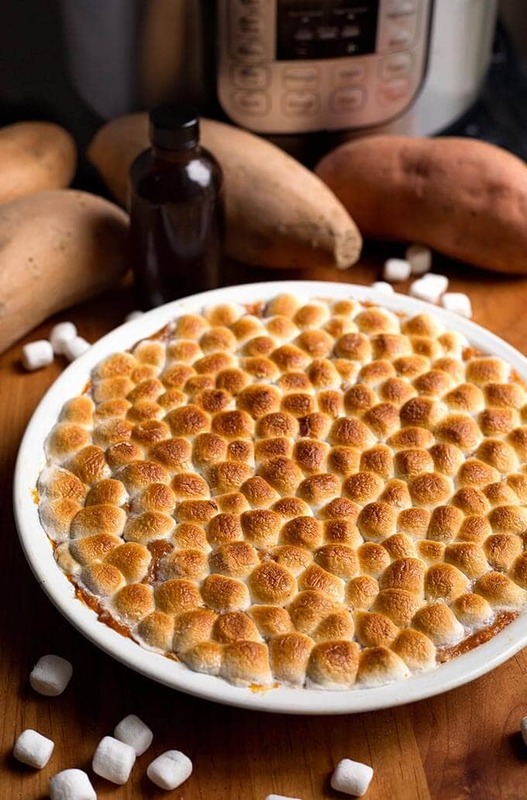 Bake at 350 degrees (F) for 15-25 minutes, or until heated through, then add remaining Tbsp of butter and the marshmallows and continue cooking until marshmallows brown. Garnish with toasted pecans (just a few minutes in a dry skillet to toast them. You can do that ahead of time). Serve immediately. *These can be made ahead and heated in the oven before serving.